Place a sheet of foil on a cookie sheet; crimp up sides of foil to form a shallow lip. Spoon 2 tablespoons of melted butter onto foil; set aside. Combine flour, sugar, salt and pepper in plastic bag; add chicken wings; seal bag and shake to coat chicken with flour. Shake off excess flour and place in on foil-lined cookie sheet. Bake at 375°F uncovered for 20 minutes; flip drummettes to brown other side. Increase oven temperature to 400°F; baked uncovered (turning as needed to brown all sides) for additional 20 to 25 minutes or until chicken is cooked through and juices run clear when cut with knife at thickest point. Drain on paper towels. Meanwhile combine remaining butter, hot pepper sauce and honey; set aside. Prepare Blue Cheese Dipping Sauce. Remove cooked chicken from oven; drizzle with butter-pepper sauce. 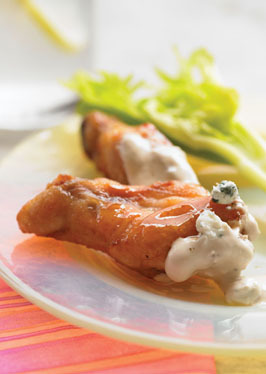 Arrange on platter with celery sticks and bowl of Blue Cheese Dipping Sauce. Serve warm. Blue Cheese Dipping Sauce: Combine 3/4 cup Darigold Crema Mexicana Agria, 1/4 cup mayonnaise, 1 tablespoon each lemon juice and grated lemon peel; mix well. Stir in 1/2 cup crumbled blue cheese. *If you prefer, purchase frozen, cooked buffalo-style wings and cook according to package directions. Serve with Blue Cheese Dipping Sauce. Tip: Blue Cheese Dipping Sauce becomes a wonderful salad dressing with the addition of 1/2 cup of half and half.